both NASA and the Federal Emergency Management Agency (FEMA) have been preparing for a global catastrophe. 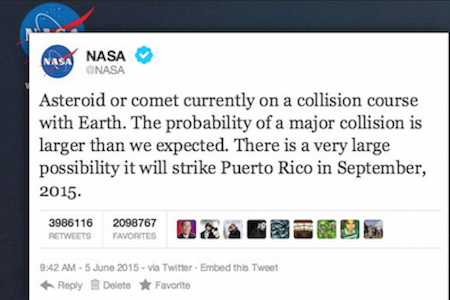 NASA has launched its ‘Hypothetical Asteroid Impact Scenario’, while FEMA has begun stockpiling on emergency supplies. Is an asteroid Armageddon just around the corner? Google Street View: Right Place WRONG Time!